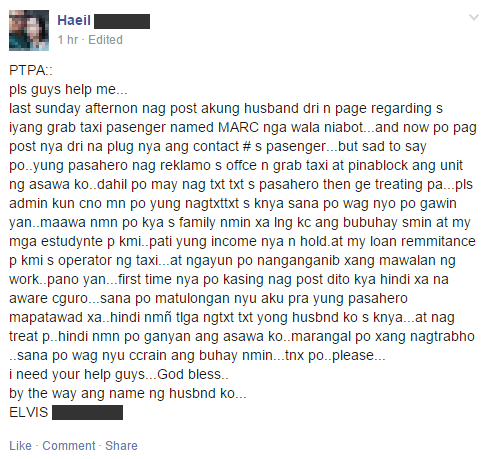 Posting a passenger's cellphone number on Facebook caused problems for a GrabTaxi driver in Davao City, who is in danger of losing his job. According to the driver's wife, her husband posted Sunday afternoon something about a GrabTaxi passenger who did not show up. The June 21 post was already removed from the page but it is believed that the driver expressed dismay at the time. Since it was allegedly his first time to post on the page, the driver accidentally included the passenger's contact number, the wife said. 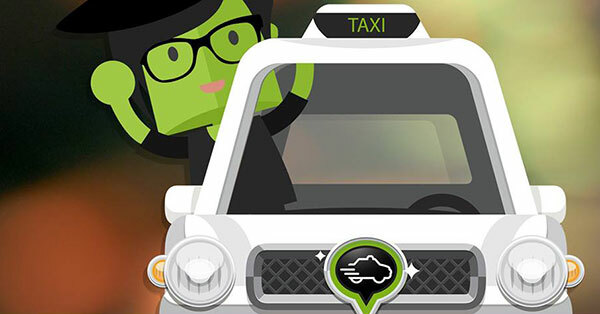 She said the passenger went to the GrabTaxi office and asked the company to block the driver's unit from the app after receiving threats via text messages. The wife added that her husband's income and loan remittances for the taxi operator have been put on hold and she's worried that he might lose his job. She hopes that the person who sent threats to the GrabTaxi passenger will ask for forgiveness so that the latter would withdraw his complaint. Lesson learned: One should think many times before posting anything on social media.